Birdsong filtered through the window screen even before the sunlight could. 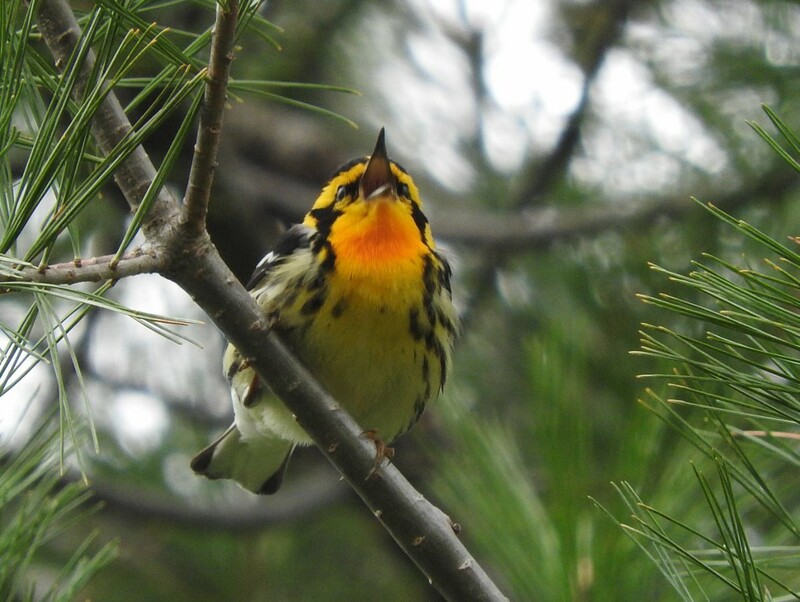 The day before, I’d woken up to the syncopated trill with a blisteringly high finale of Blackburnian warblers. Now there was a new voice in the mix. This was the second weekend in May, and each day a new wave of migrants swept in, contributing their songs to the growing chorus. Although, I’m not sure I’d call the new addition a song exactly, at least in the traditional sense. The sound was a short, emphatic, “che-bec” with an insect-like quality and an accented second syllable. It took me two weeks of my first ornithology class to recognize this noise as coming from a bird. I didn’t even hear it at first; much less distinguish it from the other call notes and red squirrel chatter going on around me. Once I learned it, though, I heard it everywhere. Occasionally I see the vocalist too, although that takes more work as the tree leaves emerge at breakneck speed and fill in the lacy network of twigs. Least flycatchers are cute little birds that weigh just over four pennies. Like most of their Empidonax flycatcher cousins, they have grayish-olive backs, whitish underparts, a white eye ring, and white wing bars. They can often be spotted as they “hawk” for insects, which entails flying out from a perch, snatching a snack out of midair, and fluttering back to the same branch or another one nearby. This describes both the general appearance and behavior of a whole group of small, drab flycatchers in the Empidonax genus. Their songs are the most distinctive things about them. The reason that their voices are so distinctive fascinates me. Other “true” songbirds will spend one period of brain development memorizing songs of adults, and the next phase trying to match them. This is true of the high-trilling Blackburnian warblers I heard earlier. 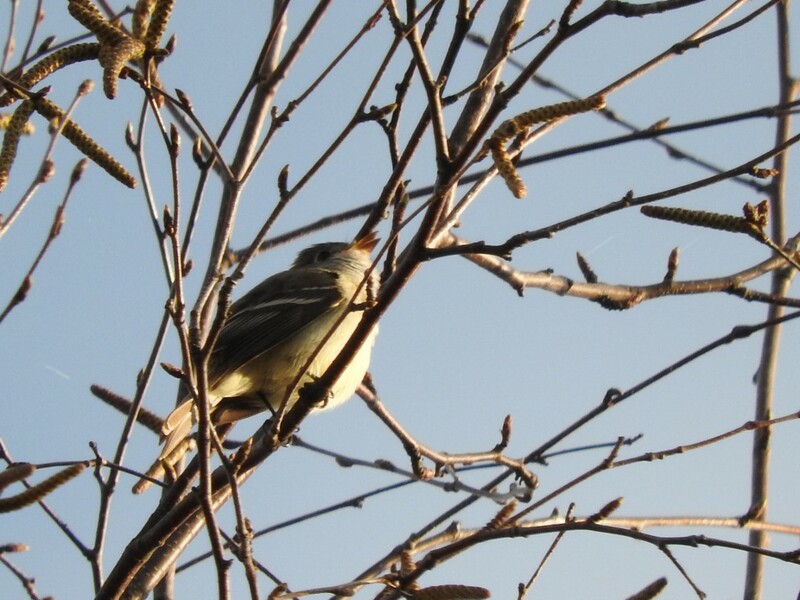 If a songbird does not grow up with adults of its own species, or can’t hear, it does not develop a normal song. Flycatchers do not need to do either! They do not need to hear other adults in order to produce the typical che-bec song, and they do not even need to hear themselves to know that they are saying it correctly. In contrast, many birds also have shorter, simpler “calls,” that sound the alarm or keep members of a flock in contact. While my morning walk was filled with least flycatchers che-bec-ing every twenty feet, and Blackburnian warblers trilling away, my evening stroll included a soundtrack by the common loon. 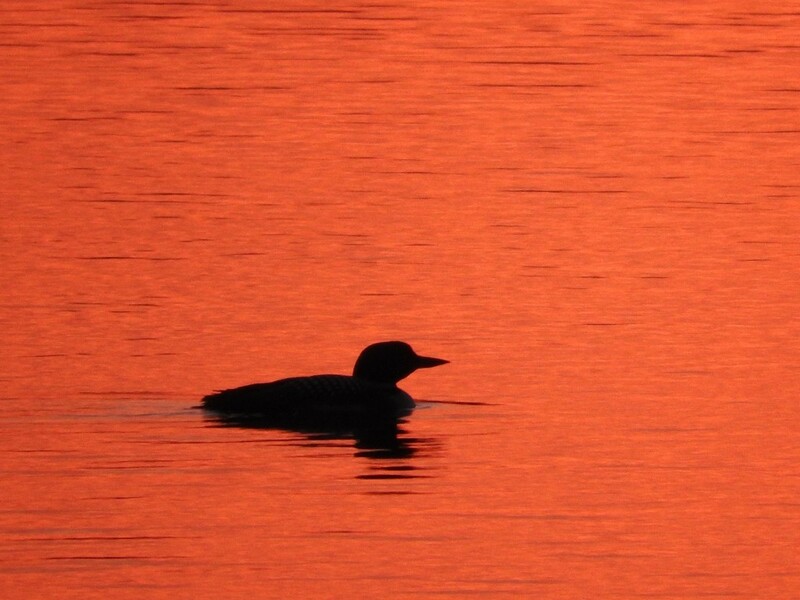 Loons are definitely not songbirds, but the males do have a distinctive territorial vocalization, known as the yodel. It’s a maniacal, up-and-down scream that clearly conveys the serious and stressful business of defending a territory (often at 3:00 a.m. when we’re trying to sleep), and each loon has his own version. The amazing thing is that when an invading loon is successful in winning a new territory, he will change his yodel. The new composition increases the difference between his yodel and that of the previous, defeated resident, while being careful not to stray too far outside of the norms for the neighborhood. When comparing the loon’s ability to change his “song” throughout his lifetime in response to specific events, to the warbler’s reliance on a distinct period of brain development, and the flycatcher’s innate and immobile programming, well, it’s easy to be amazed by how many different ways there are to be successful. Each system works for the bird who uses it. I think maybe there’s a lesson in that? Special Request: If you enjoy Emily's book, Natural Connections: Exploring Northwoods Nature through Science and Your Senses, and think it should be available for more people to read, then take a moment and request it at your local library and bookstore! Order your copy at http://cablemuseum.org/natural-connections-book/. Listen to the podcast at www.cablemusum.org! Fresh sunshine warmed my bare arms and legs as I biked along County Highway D east of Lake Namakagon. The joy of speed, freedom, and my trusty steed brought on an irrepressible smile. As we neared the bridge over a marshy flowage, a cacophony of bird songs began to cut through the whirr of tires on pavement and wind in my helmet. We pulled over onto the shoulder for a better look. Red-winged blackbirds gurgled and trilled their early spring song that is so energetic it seems to cause ice to melt and streams to flow. A pair of Canada geese honked harshly from their grassy hummock; building their pair bond by shouting together. And then a rattling cry ripped through the air. My head snapped up automatically as I followed the sound and the blur with both my ears and eyes. Finally my focus landed on a slate-blue shape just settling on the branch of a broken snag. “Kingfisher,” I said out loud, even though we both knew it already, as I whipped binoculars out of my bag. Just back from Central America, his breast was pure white with a jaunty blue band to match his powder-blue tux. A female would have had a beautiful rusty bar across her belly. Belted kingfishers are one of the few bird species where the females are more colorful than the males. Belted Kingfishers are one of the few birds where females are more brightly colored than the males. 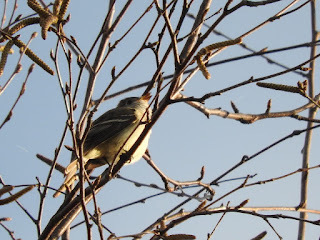 In the next moment I realized that he had something in his mouth—a large minnow probably—and he was whacking it against the branch over and over with sideways jerks of his head. At some point he decided that it was sufficiently dead. He tipped his head back, gave the fish a little toss, and down the hatch it disappeared! 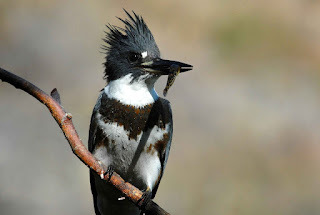 While this minnow was comfortably bite-sized, kingfishers, who are thirteen inches long at most, have been known to eat fish up to seven inches long. Their trick? They leave part of the fish hanging out of their beak until stomach juices digest enough of the fish that it can slide in all the way. Also, the bird’s tiny tongue stays out of the way. Young kingfishers have such strong stomach acids that they can digest fish and crayfish completely—bones, shells, and all. Once they leave the nest, kingfishers regurgitate pellets filled with the indigestible bits, just like owls do. Those young belted kingfishers, who hatch in May or June, keep their parents busy by consuming their body weight in food each day. Luckily, kingfishers live up to their name with the help of several adaptations. First, they can scope for prey either from a poolside perch or by hovering in one place high above the water. Like many birds, kingfishers have excellent eyesight. Oil droplets on their cone cells enhance their color vision and reduce glare as they search for prey. Two focal points in their eyes allow them to adjust for the change in refraction between air and water as they dive after a fish. The position of these two foveae gives kingfishers monocular vision in the air (each eye is used separately) and binocular vision underwater (which allows them to judge distance). A third eyelid, called a nictitating membrane, acts like protective goggles. When a kingfisher dives underwater, its sturdy, conical beak wedges into the water and pushes it aside with minimal impact or splash. Japanese bullet trains, which operate at speeds exceeding 200 miles per hour and carry more passengers than any other rail line in the world, imitate the aerodynamics of the kingfisher’s beak to reduce noise pollution and improve fuel efficiency. After grabbing the fish or crayfish with its vise-like bill, the kingfisher flies up to a perch to whack away, just like I witnessed. The chicks are fed small fish or regurgitated food. As the young grow up, parents teach kids to hunt by dropping fish into the water for the students to retrieve, just like in common loon families. While their hunting adaptations are amazing, the kingfisher’s strangest adaptation is used for digging their nest burrow in a sandy embankment. 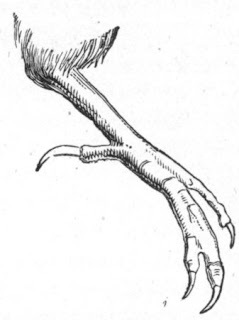 Their inner two toes are fused together, resulting in what appears be a single flattened toe. This trait, called syndactyly, is not common, but it is shared by kangaroos, wallabies, opossums, koalas, and wombats. On one of those damp, gray days in early April, I joined the North County Trail Navigators to hike a brand new section of trail east of Copper Falls State Park, near Mellen, WI. Sara, one of the group's founder, found a beaver chew! Light was low, but our spirits were high. Many of these women completed the 100-mile challenge on the North Country Trail (NCT) for the National Park Service’s birthday last year. Now they’re addicted, and are trying to hike this year’s miles before the mosquitoes hatch. Joan found a bird nest. From the gravel road where we parked, the trail snaked its way through a beautiful sugar maple forest. 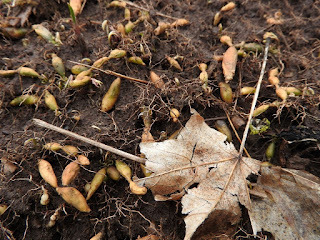 The rich soil, typical of maple forests, was soft and loamy. Great for plants, but not for hiking boots. We giggled, whooped, and exclaimed as we slipped and slid through mushy spots. With use, the soil will compact and become a more durable tread, but ours were some of the first boots to travel here. I was at the end of the line, chatting away, when I heard my name called up ahead. One of the women had spotted a mystery near the trail. In several patches, each about the size of a manhole cover, the thick maple leaf duff was pushed away. Laying exposed on the black soil were scattered chains of yellow-green plant roots that reminded me of the little plastic pop-together necklaces I won at carnivals as a kid. Each segment of the rhizome was an oval-shaped “bead.” Also visible were the lacy network of regular, thin roots. Many of the spring flowers that like to grow under maple trees survive most of the year just as underground roots, rhizomes, or bulbs. Photo by Emily Stone. Of course, with a naturalist along, the group wanted an explanation of what we’d found. I pulled out my camera to photograph the creeping rootstocks, but couldn’t put a name on the discovery. A few tiny clusters of curled-up leaves sprouted from the ends of the segments, but they weren’t big enough for a confident identification. All I could do for the ladies was list of a few possibilities: blue cohosh, trout lily, spring beauty, trillium, Dutchman’s breeches, wood anemone…the list of possibilities was long. One thing that I was certain of was that these roots belonged to a spring ephemeral. This category of flowers completes their entire life cycle in the two months or so between snow-melt and leaf-out. 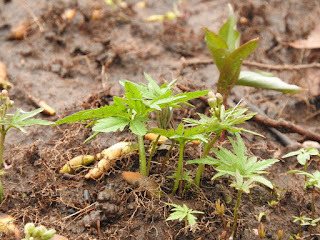 Instead of adapting to grow in the oppressive shade of the summer forest canopy, these little plants take advantage of the full sunshine of early spring. During their brief growing season, spring ephemerals bury an energy reserve in tuberous roots, modified underground stems, or bulbs. Those storage units lay dormant—and protected from drought or cold—through the winter. Come spring, leaves and flowers erupt quickly with the plentiful moisture and sunshine, provide food for early pollinating insects, and then restock their provisions before melting away under the deepening summer shade. Because so many of the spring flowers that inhabit maple forests have similar strategies, the roots we found could potentially belong to any number of the sweet and beloved blooms that grace each spring. To me, this was the most interesting part of the mystery. I did, of course, do some research at home to try and match these particular roots with a name. It’s hard to find good, identifiable photos of roots, though. Happily, the challenge just meant that in order to solve the mystery with confidence, I would have to return to this beautiful trail once the leaves had expanded. My chance came two weeks later. The trail was only slightly dryer, but the scenery had gone through a delightful change. Little green leaves pushed up everywhere, but mostly they sprouted out of the trail itself, where dark soil had warmed more quickly than the pale duff. Trout lilies, trilliums, leeks, oh my! And then I noticed a small patch of those mysterious, yellow-green segmented roots. Erupting out of their tips were the tiny palm tree-like leaves and clustered flower buds of cut-leaved toothwort. Mystery solved. 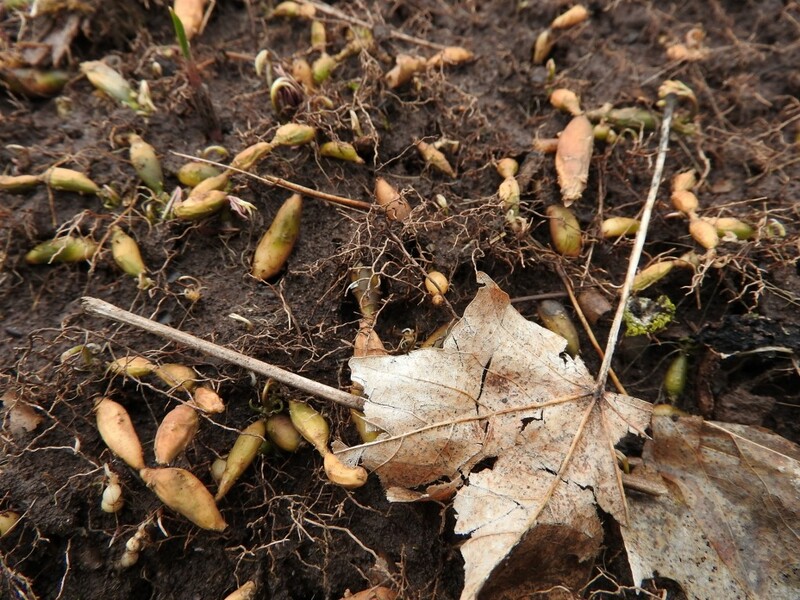 Each spring, the sugar stored in cut-leaved toothwort rhizomes fuels the growth of leaves and flowers. Cut-leaved toothwort (Dentaria laciniata or Cardamine concatenate) is a widespread spring ephemeral in the mustard family. Its common name describes both the narrow, toothy leaves, and also the canine tooth-shaped sections of it rhizomes. Its elongate cluster of pretty white flowers will each have four petals. True to its family, the leaves and the rhizomes of toothwort have a spicy taste, similar to wasabi. The flavor probably deters some herbivores, but it’s actually encouraged people to use it as a condiment and a medicine over the years. I chewed on a leaf, and it tasted like a very plain mustard. One herbivore that isn’t deterred is the caterpillar of the West Virginia White, a Wisconsin State Special Concern butterfly. The butterfly lays eggs on a few species of native toothworts, and the caterpillars must grow up before their short-lived food plants senesce for the summer. In an unfortunate twist, the non-native, invasive garlic mustard shares chemical cues that attract egg-laying butterflies, but it provides inadequate nutrition for the caterpillars. In any case, it was fun to identify friends along the trail as we all race to make the most of spring. 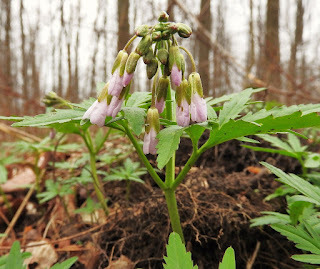 Cut-leaved toothwort is one of the earliest flowers to bloom. Its four petals range from white to pink, and they often droop until the sun comes out. Photo by Emily Stone. It’s hard to go anywhere with me in the spring. We were still within sight of the cars when I spotted my first Dutchman’s breeches leaves and veered off the trail. Fresh raindrops glistened in their clusters of lacey, blue-green foliage, and a few plants hosted spikes of tightly closed buds. Tiny whorls of wood anemone drew me further into the silver maple floodplain forest. Once I was there with my nose down, the jagged leaves of toothwort jumped into view, followed by the mottled leaves of trout lily, and an elegant bloodroot bud, still clasped protectively by its leaf. The rich soils and brief spring sunshine in this deciduous forest create the perfect habitat for a carpet of my favorite spring wildflowers. The brief appearance of these flowers each year endows them with the value and mystique reserved for things that are both beautiful and rare. Adam Haecker, Coordinator for the Northwoods Cooperative Weed Management Area (NCWMA), was waiting for me by the trail when I wandered back. He stood resignedly over a whorl of emerald green leaves, much brighter than all the others. We each picked a roundish leaf from the cluster and crushed it under our noses. The spicy scent confirmed my hunch: garlic mustard. Garlic mustard, Alliaria petiolate, is a non-native species that invades disturbed areas, and also high quality uplands, floodplain forests, and savannas. It’s a biennial, which means that first-year plants grow rosettes of emerald, kidney-shaped leaves with scalloped edges, while second-year plants grow taller stalks with heart-shaped leaves and clusters of small, white, four-petaled flowers. Garlic mustard is pretty, and some people enjoy the flavor (although my one attempt at pesto was bitter), which is why settlers brought it here from Europe in the 1800s. The problem with it on this continent, though, is that garlic mustard releases anti-fungal chemicals that disrupt the important relationships between native plants and mycorrhizal fungi in the soil. Through sheer quantity, then, it goes on to push out our beautiful—and increasingly rare—spring flowers, and even hinders tree regeneration. The loss of native plants affects insects, herbivores, and more—all the way up the food chain to our friends and loved ones who are spring wildflower enthusiasts. I grew up pulling garlic mustard’s odorous leaves out of our woods in Northeast Iowa, but hadn’t yet encountered it since moving to northern Wisconsin. We have a lot of acidic soils up here, which aren’t good for either garlic mustard or most spring wildflowers. The downside is that the special, rich woods where I go to see my favorite spring flowers are the ones that are at risk of invasion. 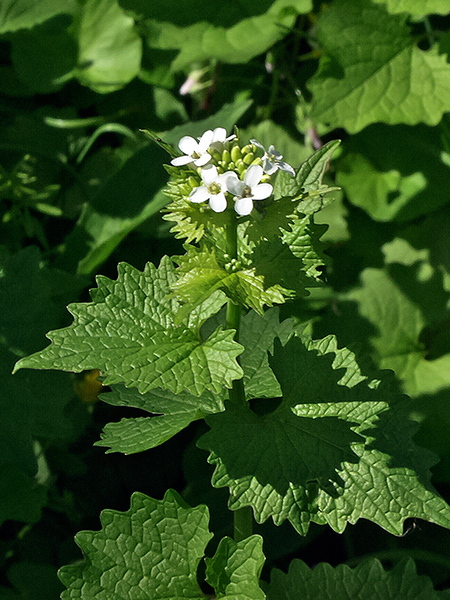 Luckily, garlic mustard is not yet common in the Northwoods. Adam and the NCWMA would like to keep it that way. The Northwoods Cooperative Weed Management Area is “a collective group of state and federal agencies, municipalities, tribes, nonprofits, community organizations, and individuals who have come together to combat invasive species in Douglas, Bayfield, Ashland, and Iron counties in northern Wisconsin.” I’m impressed by the cross-agency cooperation, and by their accomplishments. Garlic mustard was discovered in 2007 on this 75-acre site along the Bad River floodplain in Mellen, near Copper Falls State Park. Its position in the floodplain gives a likely explanation of how the invading seeds arrived. For that same reason, controlling garlic mustard so that it doesn’t spread farther downstream is a high priority for the NCWMA. The land is mostly privately held, but the owner has been supportive of the garlic mustard removal efforts. Each spring, a group of about 30 natural resource professionals from the NCWMA, plus volunteers, descend on the site and do their best to eradicate the spicy, bright green leaves. Hand pulling is the most common method, but it must be done with care. Plants can re-sprout from broken roots, and the flowers can set seed even in a heap. The workers carefully haul out all plant remains in heavy garbage bags. Garlic mustard stays green all winter, while native plants are dormant. On the shoulder seasons it’s possible—using extreme caution—to use a glyphosate herbicide on extensive infestations. No matter which removal method is used on a site, part of the project’s success is a dedicated effort. Each garlic mustard plant can produce more than 100 seeds, and they remain viable in the soil for around seven years. Repeated pulling is essential. The NCWMA’s efforts are paying off. Plots on this floodplain that were once covered in thick patches of garlic mustard now only sport a few first-year plants. Another site along the Montreal River, near Hurley, WI, is receiving the same treatment and seeing similar, positive results. The keys to success are early detection, landowner involvement, and a dedicated removal effort. volunteer with the NCWMA on fieldwork days. (There’s one coming up on May 9!) Everyone can keep an eye out for it and other invasive species, and report sightings to Adam at the NCWMA by calling 715-373-6167 or emailing ahaecker@bayfieldcounty.org. If landowners discover garlic mustard on their property, a quick call to the NCWMA, WI Department of Natural resources, Great Lakes Indian Fish & Wildlife Commission, or any other local natural resources agency will initiate a process that includes a site visit, inventory, and plan for removal. The Wisconsin DNR website is an excellent resource for tips on identification, prevention, and control. While garlic mustard receives a lot of attention, particularly because it’s still rare enough to have a chance at control, the NCWMA also organizes removal efforts for Japanese knotweed, wild parsnip, purple loosestrife, and a whole list of other invasive species. You can find more information on their website: http://www.northwoodscwma.org. After finding that patch of garlic mustard, Adam and I explored a little farther down the trail. Silver maple trunks arched gracefully above, but my eyes were on the ground. Despite our searching, we couldn’t find another cluster of the invasive plant. 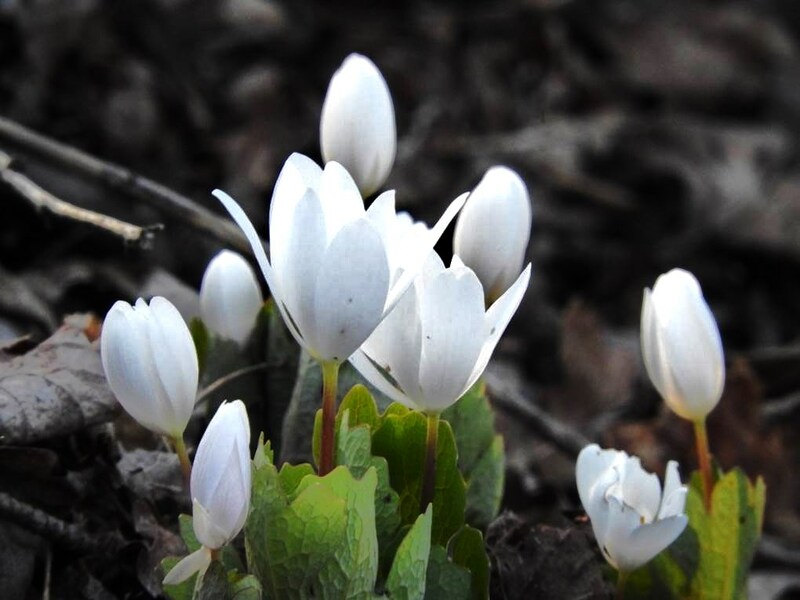 What we found—thanks to the hard work of the NCWMA—was a beautiful diversity of spring flowers, just getting ready to bloom. Special Note: This article was written in partnership with the NCWMA. Emily's book, Natural Connections: Exploring Northwoods Nature through Science and Your Senses is here! Order your copy at http://cablemuseum.org/natural-connections-book/. Listen to the podcast at www.cablemusum.org! For 50 years, the Cable Natural History Museum has served to connect you to the Northwoods. Come visit us in Cable, WI! Our new exhibit: "Better Together--Celebrating a Natural Community" will open on May 2!